I feel it’s necessary to warn everyone who is reading this article. There’s been some very negative feedback from customers of Appalachian Leather Works. As much as I stand by their products I’m afraid their business tactics of late have become troublesome. I’ve reached out to them several times. Attempting to resolve some of the issues the commenters on the post have left, but I’ve heard nothing back. 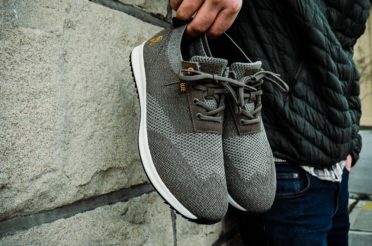 It pains me to say this, but I feel it’s only fair to let everyone know that they will probably have to look elsewhere for a product rather than purchase from Appalachian Leather Works. 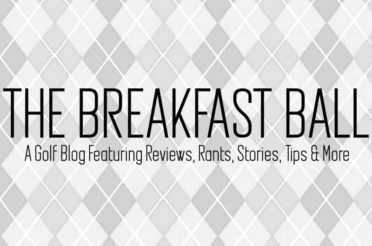 As my golf education has grown since starting this blog, I find it amazing how much I used to think of what was acceptable or “OK” in the realm of the golfing world. I seriously thought there was nothing wrong with trotting out there wearing some hole-filled, off brown cargos and swinging with baseball batting gloves on both hands. Yup, I was Matty Two Gloves long before Tommy Gainey was ever considered to be a PGA Tour-caliber player. Don’t misinterpret my words, though; I honestly could care less what anyone wears while playing and I believe the majority of courses are a bit full of themselves when it comes to the dress codes . . . But I get it. My moment of clarity came when I started reviewing products for Three Guys Golf a few years ago and firsthand got to experience the luxury side of golf by wearing “Real Golf Clothes” (as I like to call them). Being brought on as a contributing writer at Three Guys has been a tremendous eye-opening experience. 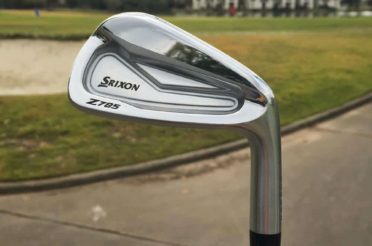 Reviewing apparel and gear has changed my entire perspective about golf and greatly enhanced my respect for this game, but most of all it has helped with my education and growth as a golfer, something I was never expecting. Without even considering my swing (that could be 10,000 words three times a week), but instead thinking about all the other aspects that are involved in the game I look back and realize “damn,” I’ve come a long way since my days of hacking up Ole Desert Rose. Items like a simple divot tool, I know, I know, gasp in amazement as you rightfully should. Never in a million years would I have thought about carrying in my pocket a divot tool. Same with a ball marker. You could use a tee for both purposes. The list goes on, a towel for my bag, a laser range finder, a brush to clean my clubs, etc., etc., etc. 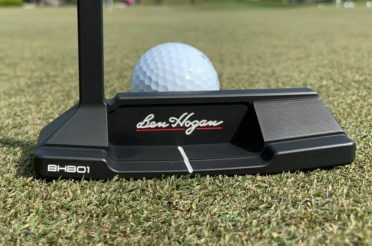 It wasn’t until I first walked a course for “real” earlier this year at Streamsong that I even took into consideration a Yardage book or Scorecard holder. I mean that’s what the steering wheel in the cart is for, am I right? Watching everyone else whip out their covers that day and quickly log in their scores while I fumbled to write down my numbers on the fat of my leg as I bent over was all it took for me to want one of my own. 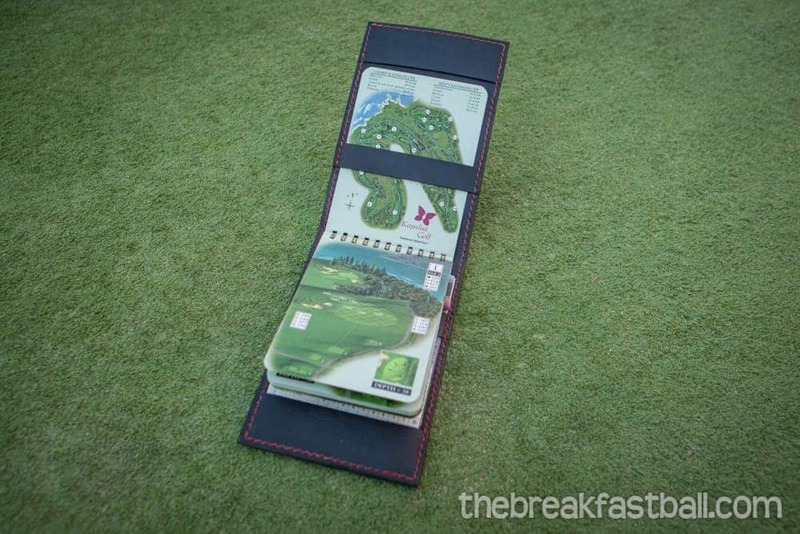 Watching the PGA Tour on any given weekend you’ll see all the players with their Yardage Book covers, but seriously, I never fully understood what the deal was with them. I always looked at it as a “Pro” thing; why would I ever need one. If there was anything, I learned from the round at Streamsong it was this: If you’re ever going to walk a golf course, then having a well-made and functional cover to keep your yardage book and or scorecard safe from the elements and easily accessible is a must. Lucky for me, the very next day after Streamsong, I had the great pleasure of playing some golf with Chris Ashley, the owner of Appalachian Leather Works. The time we spent on the course was a perfect way to get to know him a little better and find out about his amazing company. I was delighted when Chris contacted me earlier this year and asked if I’d like to review one of his covers. With a resounding “YES” I let him know it would be an honor to do the review for him and I anxiously waited for my new cover to arrive! 100% Hand Made right here in the United States, Appalachian Leather Works offers a wide variety of premium leathers and exotic skins combined with your color of thread choice to give you a very customizable and unique cover that you won’t find anywhere else. The detail on the cover I received is outstanding, and it was easy to see why Adam from Three Guys and fellow writer on this site, Andrew, spoke very highly of them. Andrew has three to date, and I’m sure he’s on the hook for a few more later down the road. I was thrilled when I opened up the package and saw the cover for the first time. 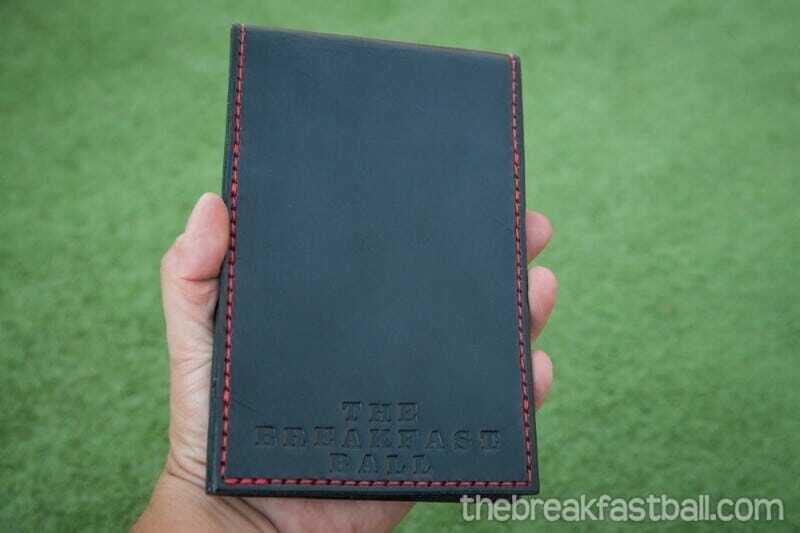 I was even more elated when I turned it over and saw that Chris had added in a little extra something to make this cover even more personal to me by embossing ‘THE BREAKFAST BALL’ on the front. How awesome is that! What I noticed right away was how thick and durable the cover was. 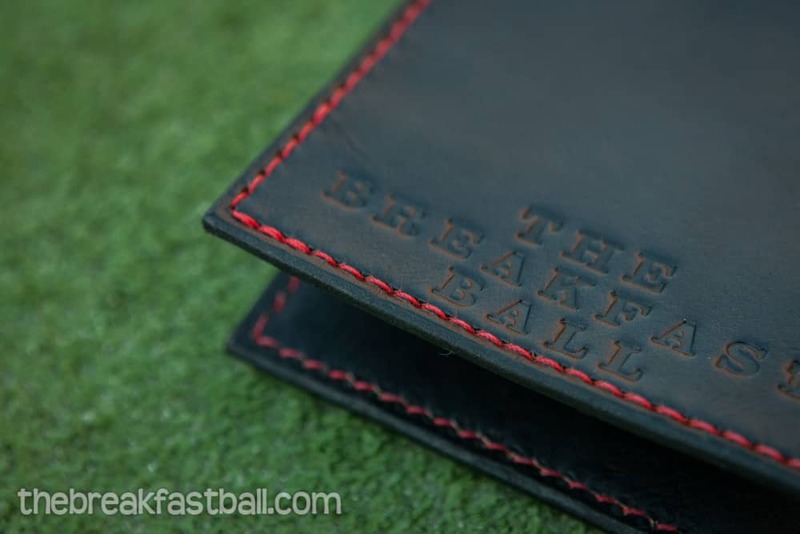 You will never mistake the Appalachian covers for one of those cheap, floppy, overpriced imitation leather covers with the course logo embossed on the front. 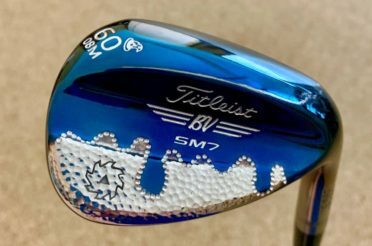 I found that out the hard way with my silly purchase while in the Streamsong pro shop. Chris and his family go to great lengths to make sure that every one of his covers is done with quality, precision, and some good old fashion elbow grease. They’re more than just a cover. Some might even be inclined to call them works of art. There isn’t a scorecard that his covers will not hold. I wish there was an industry standard when it comes to scorecards. But, courses are going to do what they want to make their scorecards stand out. Even if that means making an obnoxiously oversized 3-page monstrosity (I’m talking to you Ironhorse Golf Club) of a scorecard. Yes, there will be cases where the scorecards will not fit. But for the most part, I’d say 99% of the 150+ scorecards I have in my archives fit. And believe me, I checked! I’m not much for flair or dramatics. So I went with a simple choice of black leather with red stitching. I love black; it just looks elegant to me, especially in leather. On the inside of the cover, you’ll see a spot to hold a pencil. 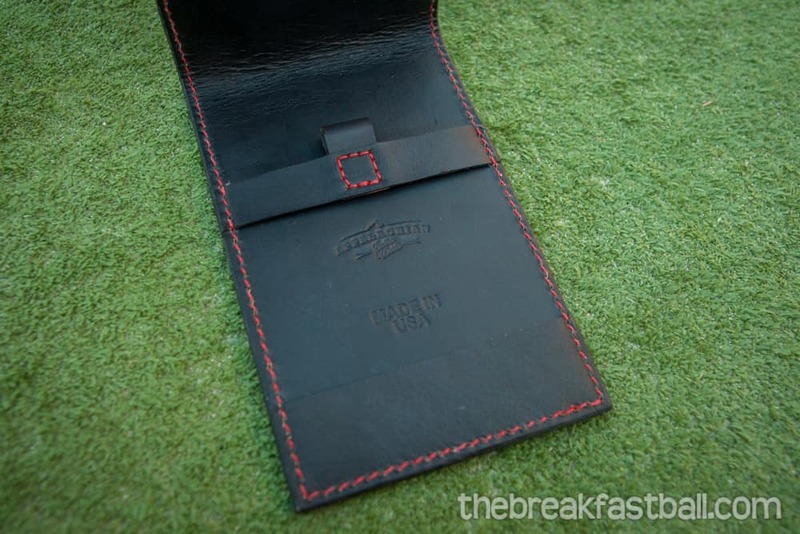 The upper and lower straps are there to help keep your books or scorecards in place. Also inside you’ll find the Appalachian Leather Works logo alongside the “MADE IN USA” one. For their stitching process, Chris uses the Saddle-Stich technique. Thanks to Google and YouTube I was able to do some research and find out why this method is preferred. After watching some videos it’s a no brainer why this method is ideal.. The stitches are so robust and secure. I doubt any one of them will ever come out. But, in the event, one does come loose, you’re not going to have the thread unravel. I’ve been using the cover for a while now. Honestly, I have no idea how I was getting along without one. It stays right in my back pocket during my rounds. If I need to obtain a distance, I usually would walk back to the cart and retrieve for my laser. 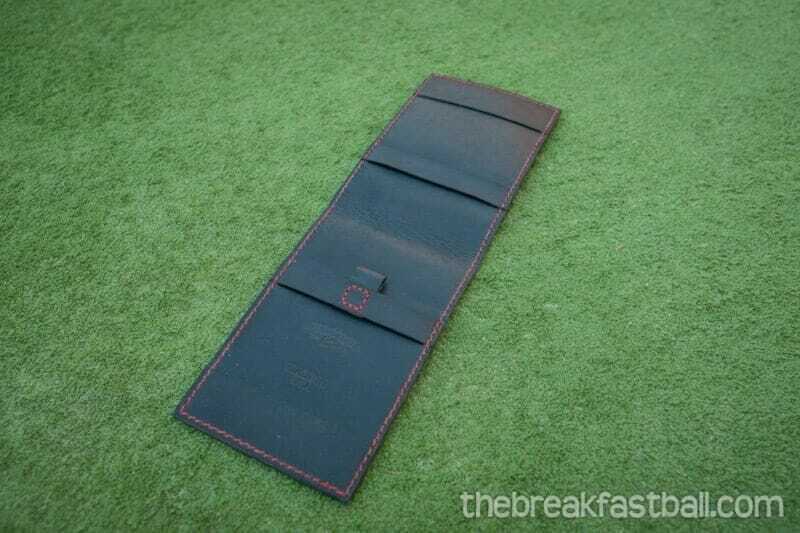 Now, I can reach into my pocket, open up the cover to the yardage book and get an idea of where I’m at on the hole. It’s already happened a few times and saved me from making some costly mistakes. Another benefit is how I’ve been able to distance myself from the golf cart. Out here in Vegas, we don’t get to walk much. The courses are pretty extreme to walk. And, I’m sure course management isn’t too excited about people strutting through the desert on a 115° day. To detach myself from the cart I’ve been letting other people drive (I used to be that guy that “had” to drive) and then I do my best to get out of the cart and walk the last 120-100 yards of the hole. It’s a nice break from the hustle and bustle of being confined to a cart for 18 holes. A lot of that ideology stemmed from the round at Streamsong. Having all my information with me inside the cover has freed me from the constraints of a cart. I no longer have to wait to get back to the cart before logging in my score. 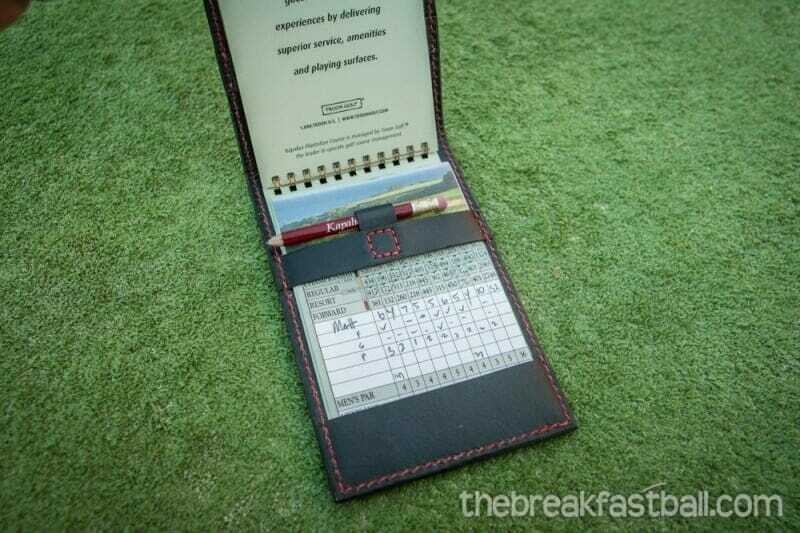 After I putt out, I grab my cover, write down the stats I track for the hole and move on. It’s sped up my game a tad. Appalachian Leather Works is worth a look. 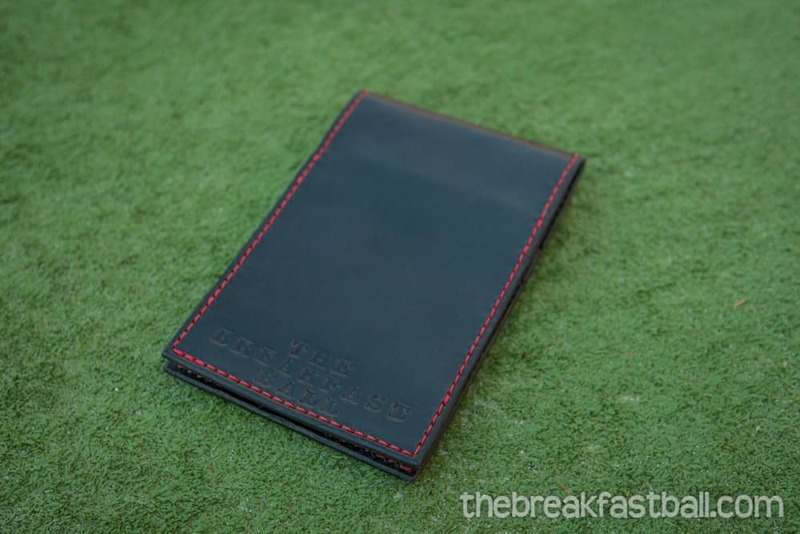 So if you have thought about investing in a high-quality, durable, unique custom handmade yardage book, scorecard, or cash cover then be sure to check out their website. The Custom “Executive” Leather Yardage Book Cover you see here starts at $95.00. They also offer customization with three initials at no extra charge. They also offer several other variations, and with the leather and exotic skin choices, your custom order possibilities are endless. Since these are handmade, there is a process for making such a high-quality cover. And it does take time so figure approximately three weeks for delivery. Andrew told me I wouldn’t be disappointed; it’s worth the wait. And he was so right. I can say without any doubt the same thing to anyone who purchases an Appalachian Leather Works cover; you will NOT be disappointed. I placed and order in November 2017 for a Christmas gift for my son. I spoke to someone on the phone to place the order. Received email that order was complete. Have I received my product as of February 1, 2018? NO !! No one answers the phone, or replies to emails. I had a similar experience. Ultimately had to call my bank to get a refund. I wouldn’t recommend this company to anyone. Terrible experience with a huge lack of communication and professionalism. Apology letter was nice…NOT! How about a refund to the folks they ripped off? I waited and waited, thinking they were running behind. No communications from them… PERIOD. Now I’m left fighting with the credit card company trying to explain why I waited so long to dispute the charge. Seems like a great plan to defraud people. Make your waiting time for a product longer than the window to dispute the charge. Wonder how many people you have to defraud before a class action lawsuit is an option. The really sad part is they are still taking orders $$$ but no one is getting anything from them. Unfortunately I had the same disappointing experience as Kyle. I placed an order in September – having left several voicemails as well as emails and not a single follow-up. Not sure what to do since they collected my payment upfront. Their products look totally amazing but i’m guessing i’ll never actually get to see one in person. Their blog post apology means little to me since it actually posted in 11/2015 so they should have either stopped taking orders or ramped up their customer service by now. 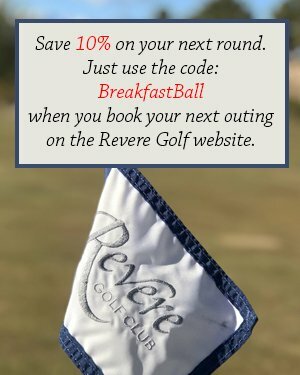 I appreciate The Breakfast Ball highlighting unique new companies, but sadly I think you should pull this one from your website. Appreciate the info Dane. I have sent them a message asking what is going on with the company. Once I hear back I’ll be sure to update the post with some current information so this doesn’t happen to anyone else. Thanks for being a reader and more importantly for leaving the comment! I ordered my yardage book in early September… I was charged and they collected my monies when I submitted my request. 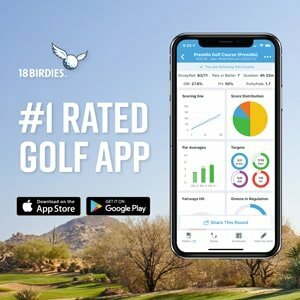 I still have not yet seen the yardage book, nor have I gotten any kind of reply from my dozens of e-mails, phone calls, and texts over the last four plus months. This business is SHADY! STAY AWAY!!! I would like to take this opportunity to apologize to you for our lack of excellent customer service in recent months. We haven’t fulfilled orders in a timely manner and have lacked in communication with you. It’s been difficult keeping up with our high volume of orders and we dropped the ball. We understand how much of an inconvenience this was to you and we take full responsibility. We are putting in place new procedures to prevent these kinds of things from happening in the future. In the meantime, we have decided to hold off on accepting custom orders at this time so we are able to devote our full attention to our current customers. We do offer many ready-to-ship pieces that can be personalized and hope you will be able to find something you like. We can’t tell you enough how much we appreciate your business. We’re still amazed at how much we have grown in just 3 years. We started out in a tiny room in our house in the mountains while Chris attended App State and I stayed home with our two boys at the time. It was such a blessing because it came when we needed it most. After moving twice this past year we fell really behind. We did not expect this kind of growth and were completely unprepared. We hope you can forgive us. 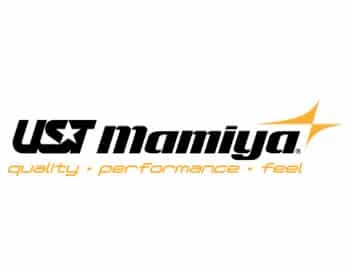 We look forward to getting back on track and making some changes so we can better serve you and keep you as our valued customer. Not sure if that makes your situation any better and I’ll reach out them and see if it can help with your issue. Knowing the owner of the company I assure you they are anything but shady and nothing but good people who’s success has really hurt them. Hope everything turns out ok for them and for you. @AppLeatherWorks By far the best! It’ll be in my back pocket tomorrow for my biggest tournament of the year in St. Louis.. Since email didn’t work you may want to check their social media accounts; twitter and Instagram. I know it’s a lengthy and meticulous process for each order but 2 months does seem excessive. Hopefully your order will be to you soon.